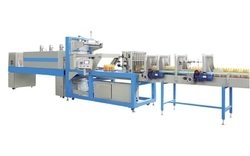 Our product range includes a wide range of automatic bottle rinsing filling and capping machine, beverage production plant, cap sealing machine, rfc machine, ropp capping and semi automatic ropp capping. 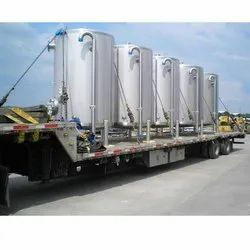 Beverage Production Plant (Syrup Preparation Plant) Storage tanks, jacketed tank. 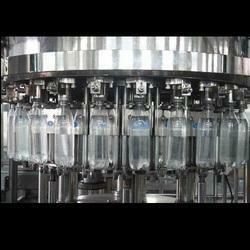 We offer a turnkey solution for carbonated drink manufacturing plant and machinery. We are manufacturing Automatic Cap Sealing Machine with Leak-Proof and Advanced Technology please do contact us for further Technical Information. We are the manufacturer of RFC MACHINE in Ahmedabad Gujarat, please do contact us for further information about your application and requirements. 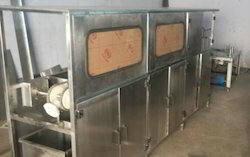 We are manufacturing ROPP CAPPING MACHINE having provision to Seal all type of ROPP CAPS which is mentioned in images. We have supplied this machine to Nigeria, Uganda, Russia, South Africa, Latin America and other South East Asian Countries. Kindly contact us for further information about your requirements. 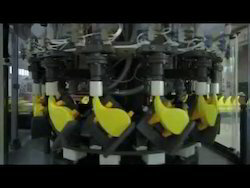 We are manufacturing Semi Automatic ROPP CAPPING Machine for crimping of caps into bottles, we have supplied this machine to Kenya, Uganda, South Africa, Pakistan, Nepal, Bhutan, Rwanda, Iran, IRAQ and other few countries. We would like to request you to kindly contact us for further information about your requirements. We are manufacturing wide range of packaging machines, automatic/semi-automatic forming, filling, sealing and capping machines. Manufactured using high-grade raw materials and utilizing innovative production techniques. 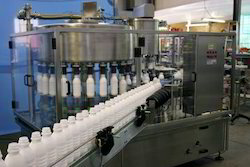 We are the manufacturer of Liquid Bottle Filling and Capping Machine, Different type of Items like Buttermilk, Milk, Yoghurt, Sauce and Cosmetic and Chemical can be filled in this Machine. Our competitive advantage is the quality of our equipment and our after-sales service. We export machines into Europe, so they are EU compliant. Our equipment is also extremely robust and uncomplicated to use. Because we manufacture the majority of parts ourselves, we can easily provide clients with spare components. We have cut our teeth in the dairy business which is probably the most difficult industry in terms of hygiene. The equipment must be cleanable and of such a standard that no bacteria is trapped. If you can manufacture machines for the dairy industry, you can basically manufacture for any other sector. 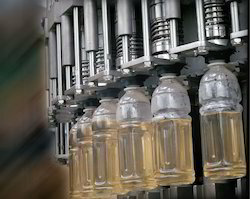 With the continuous support and sincere efforts put by our experienced professionals, we have been the prominent manufacturer and supplier of a qualitative range of Soft Drink Glass Bottling Machine. 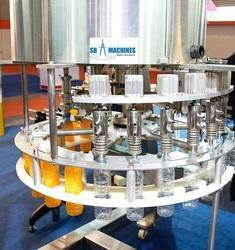 This machine is widely used for filling soft drinks in glass bottles. The provided machine is manufactured by our skilled professionals using premium grade components and latest technology. Offered machine is highly demanded by our clients for its smooth operations and high functionality. 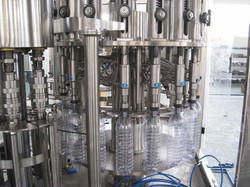 The carbonated filling tri-bloc is used to bottle carbonated beverage, sparkling soft drinks, flavored soft drink with CO2. And so on in glass bottles. 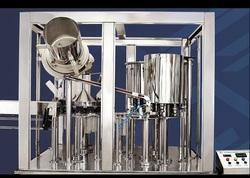 This machine is integrated with washing, filling and capping in one machine. 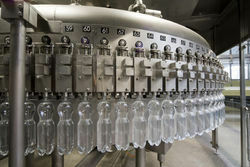 It takes bottle handling technology, which makes changing different size bottle more easily. It can do the bottles with size 200 ml to 2000 ml. And little spares are need when changing bottles. We suggest users take same specification bottles, especially the same bottleneck. Our tri-bloc uses high-quality stainless steel 304, which makes sure the quality of the products. The washing we take reversing bottle methods. It has so many washing heads which will spray the inside of the bottle after the bottle is reversed. After washing, there will approximate 2 seconds dropping water. 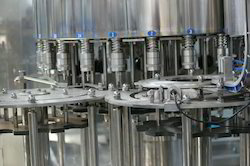 The filling technology is named “Counter Pressure Filling”, it means when bottle enters into the filler, the filling tank will firstly inputting enough pressure to the bottle. Just after the pressure in the tank is same as the bottle, filling begins. Capping we use magnetic capper. And capping power can be adjusted. We equip the machine with “No-Bottle, No-Cap” system. If there is no bottle, the caps feeding will be stopped. The capper feeder is stood beside the mono-bloc, which is parallel to the machine. Above all our mono-bloc is high quality and is just the machine you are looking for. It adopts the neck holding type conveying-bottle structure to make changing bottle model more convenient, faster and more. The main machine adopts advanced PLC control technology. We are a manufacturer of Corrosive Liquid Filling Plugging and Capping Machine for the container like Harpic Bottles, Toiler Cleaner etc. We are the manufacturer of Water Filling Machine with Advance Technology and Futuristic Automation, Please do contact us for further information about your application. 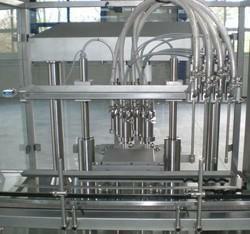 We are the manufacturer of Automatic Rinsing Filling and Capping Machine for Juice Filling as well as water filling. 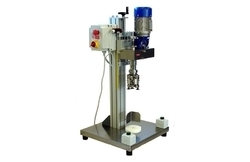 We have taken every possible quality measure into consideration while manufacturing the Shrink Sleeve Applicator. With the use of the heating mechanism, this machine ensures the best output in terms of labeling and packaging line. The high-speed production of this machine makes it the most preferred shrink sleeve applicator in the market. Comes with the assured quality check, it is value for money design. 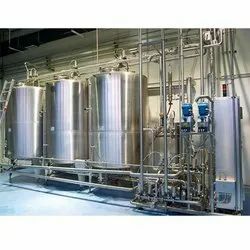 SB Machines has developed a system that optimizes the process and reduces the fermentation time by supporting the natural convection processes during fermentation. Significant time savings can be achieved without compromising beer quality. 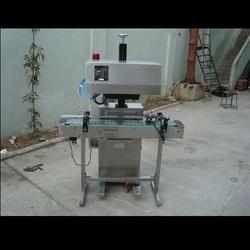 Looking for Automatic Water Washing Filling and Capping Machine ?